Microbiologists are scientists who investigate the world of microscopic organisms including all bacteria, protozoa, and viruses, along with some algae and fungi. The microbes studied can be found everywhere from thermal hot springs (more than 100 degrees Celsius) to Antarctic ice shelves (less than 0 degrees Celsius). Therefore, microbiologists can be found everywhere. Microbiologists are often associated with determining the microbes involved with causing disease, but their work extends into every other facet of life. Working variously as immunologists, epidemiologists, etiologists, chemotherapists, and microbial taxonomists, microbiologists identify, control, and prevent organisms from causing disease. Microbiologists can study transfer of genetic information from one organism to another (genetics) or the control of chemical metabolism inside organisms (physiology). Industrial applications using microbes can vary greatly. Microbiologists can use microscopic organisms for bioremediation (cleaning the environment), pharmaceutical uses (discovery and production of antibiotics), food microbiology (using microbes to produce/protect food and beverages), and fermentation technology (production/manufacture of products like vitamins and enzymes ). 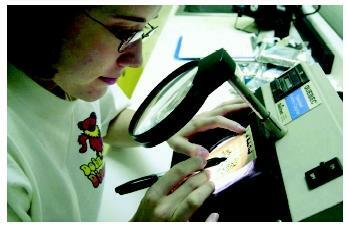 Microbiologists can work for a wide range of employers in either the public or private sector. Public sector employers include many federal governmental branches, along with state and county health departments. The private sector includes pharmaceuticals (e.g., Eli Lily), genetic engineering companies (e.g., Monsanto), biotechnology firms (e.g., Promega), food and beverage industries (e.g., Budweiser), and chemical supply/manufacture companies (e.g., Sigma). A quality control microbiologist inspects a bacteria culture from ground meat processed at a slaughterhouse. help train microbiologists to work in hospital departments such as microbiology (identifying organisms), chemistry (profiles of patient physiology), cytology (identifying abnormal cells), and blood banks. In order to prepare, students in high school could take classes in the following subjects: microbiology, health sciences/terminology, basic and advanced biology and/or chemistry, and biochemistry. Madigan, Michael T., John M. Martinko, and Jack Parker, eds. Brock Biology of Microorganisms, 9th ed. Upper Saddle River, NJ: Prentice Hall, 2000.